Leersia oryzoides (L. ) Sw.
Culms: Tufted, but with slender rhizomes. Culms mostly spreading, often decumbent below, distally erect; nodes pubescent. Blades: Flat, 4 to 12 inches long, 1/4 to 3/5 inch wide, margins with stiff, spine-like hairs, tips long-tapering to points, surfaces very rough. Sheaths: Slightly keeled, usually rough with minute, stiff, downward pointed hairs. Ligules: Truncate, minutely ciliate, to 1/12 inch. Inflorescences: Panicle, pale green or whitish, open, terminal one 6 to 12 inches long, exerted or sometimes partly included; branches numerous. slender, spreading, lower part of branch without spikelets; lower part of panicle with 2-4 branches per node; late season axillary panicles reduced, included in sheaths. 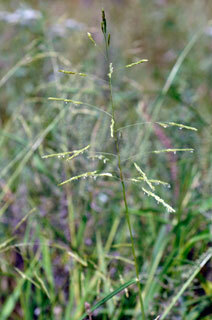 Spikelets: Overlapping in spike-like clusters of 3-8 at ends of branches; 1-flowered, oblong to narrowly elliptic, 1/6 to 1/4 inch long; glumes absent; lemma and palea with fringe of eyelash-like hairs along keel. Habitat: Margins of streams, ponds, and lakes, and marshes, ditches.